Cycling in the Himalayas really involves a combination of travelling by bus, walking and cycling. There are sections of one's journey which involve long, uphill climbing which are best covered by mounting one's cycle onto a bus so as to arrive at the starting point of one's real journey. 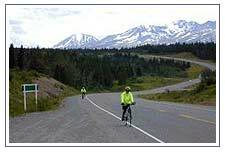 For instance, the road sections from Kalka to Shimla or Kathgodam to Nainital, or Chandigarh to Manali where the road climbs steadily upwards for kilometre after kilometre and where bus and car traffic are heavy, give no pleasure to the mountain cyclist. But first, choice of a cycle. There are a wide variety of models in the market from which one can choose. There are cycles with sprung suspensions to cushion one against the bumpy roads, cycles with broad deep threaded tyres to grip the road more firmly, cycles with slim sporty trims for greater lightness. One can choose any of these. However, one essential feature that is required is that the machine should be equipped with multi speed gears to enable one to deal comfortably with the climbs and slopes of the mountains. In addition, one should carry with one the wherewithal to repair a puncture and a spare set of brake shoes. The main trunk routes, which enter the Himalayas, are not suitable for the recreational cyclist. The truck and bus traffic that flows along them almost throughout the year makes cycling hazardous and unpleasant. But there are dozens of less frequented routes in the mountains where travelling by cycle is an entirely joyful experience. The Himalayas provide a plethora of choices that you can select from, but the foremost destination to start off any biking trip is Ladakh, the cold desert of India. The biking adventure list of the Indian Himalayan region include from light and introductory cycling to the ultimate challenge of travelling age-old trade routes winding along the mountain ranges toward higher Himalayas. One can make a beginning in an area, which does not initially require much exertion. The Terai forests along the foothills of Nainital give one an introduction to the pleasures of cycling and yet do not unduly tax your physical capabilities. One can start from Thakurdwara and cycle on to Ramnagar on the outskirts of Corbett Park. From there, a scenically attractive road runs through Kaladhungi, once home of Jim Corbett on to Haldwani. Along the way, there are numerous side roads, which you can take to explore the interior of the Sal and Teak forests that run alongside the road. At Haldwani, one should load one's cycle onto a bus and journey up to Nainital. From here, a road runs down hill to Bhowali and on to Khairna at the bottom of the hill before ascending to Ranikhet. The road is well wooded and cycling through it gives one the thrill of speed along with the joy of close proximity to he forest. The section from Khairna to Ranikhet is a steep gradient and unless one is anxious to prove a point, it should be covered by bus. Ranikhet, situated on a rolling, forested ridge is excellent cycling country and from here the road takes one downhill for 20-km till it reaches Kosi where one turns off to cycle along the banks of the Kosi River. The Kosi runs through a broad valley with richly cultivated fields on either side till it reaches Someshwar from where one has to climb of about 5-km through densely wooded hillsides of pine and oak till one arrives in Kausani. Kausani gives one a dramatically close-up view of Trishul as well as the snow ranges starting from Panch Chuli in the east, past Nanda Devi, Nanda Ghunti, Kamet and Chaukhamba towards the west. From Kausani one can give the cycle its head and feel it race down the hill, rather like a homing horse, to Baijnath with its thousand year old temples on the banks of the Gomti River. Follow the Gomti River through its beautifully wooded valley till Bageshwar. Bageshwar lies at the bottom of a bowl, and from here onwards all routes involve a steep climb. 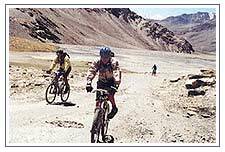 Himachal Pradesh too offers some extremely attractive areas for the lover of mountain cycling. One can start from Kumarhatti on the Shimla-Kalka road. A link road runs through a forest of pine, rising and falling till you reach Sarahan a small Tehsil town. From Sarahan, the road drops steeply to Nahan and you race down through heavily wooded dark forests on a road, which is remarkably free of traffic. Nahan is a small town with many old mansions and palaces, relics of the old order when social mores were regulated by the princes and the landed gentry, certainly a time when the social tensions of today were absent. Nahan looks down upon the valley of the Markanda River. As one leaves Nahan, the route runs downhill till one crosses the river and then you turn to cycle along till you reach Paonta Sahib with its Gurdwara on the banks of the Yamuna. First cross the Yamuna and then turn east along a canal with the Shiwalik or Shivalik ranges on your right and cultivated fields stretching away to your left. A road runs along the canal and so one is completely insulated from the traffic, which travels from Paonta Sahib towards Dehra Dun. Follow the canal, past the Aasan Barrage and then turn off to Dakpathar. Dakpathar is where the Yamuna emerges from the mountains and is arrested by a major barrage. On your way, you cycle through fertile fields of the Doon valley set against the backdrop of the sadly denuded lower reaches of the Garhwal Mountains. From Dakpathar, you take a route, which finally leads one out of the Doon valley. Turn south, through the rather unprepossessing towns of Vikaspuri and Herbertpur, till one starts climbing the Siwaliks at Timli. A gentle ascent takes one to the crest of the Siwalik range and from here one can savour the cyclist's joy of rolling effortlessly down past Badshahbag and Kalsia, till one reaches Saharanpur. At Saharanpur, the cyclist is once more back in the world of car and bus traffic and it is time to load one's cycle once more on to the top of the bus. From the hills of Kumaon one can proceed to the more rugged mountainscape of Garhwal. One can begin one's journey at Mussoorie, which is easily attained by loading one's cycle onto a bus. From Mussoorie one can cycle along the road as it rises and falls to Dhanaulti with its wooded glades, past the Surkhanda Devi temple, till one reaches Chamba. There are not many Pine or Oak trees on this route which has been gradually denuded of its forest cover, but if one passes through it in March, one will find Apple and Pear trees in full bloom as this is an area where, in recent years, attempts have been made to develop Horticulture. Chamba has a tourist bungalow located on the crest of a range, which gives one a commanding view of the valley and the snow ranges beyond. From here one can roll down easily to Tehri, a town on the verge of being submerged by the highly controversial Tehri Dam. One leaves the town to its uncertain future, and travel up the valley along the Bhagirathi River, till one reaches Dharasu. This is the point from which a road links the Bhagirathi valley to the Yamuna valley. This involves a steep climb up to the watershed between the two rivers, which lies at Rari Pass. 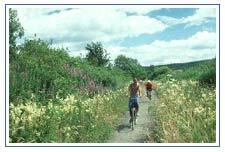 The route passes through beautiful, densely wooded forests of Pine, Oak and Rhododendron. It is a steady climb from Dharasu to Rari Pass, Bhut the area is so beautiful that you should take the time to savour it by covering it on foot. From Rari Pass, one can roll down with greatest ease, through a thick forest till one reaches Barkot, the take-off point for those wanting to visit Yamunotri. At Barkot one joins the Yamuna River and follow it downstream, past Naugaon and Damta till one reaches the Yamuna Bridge. Here one can leave the Yamuna to return to Mussoorie, a climb of 26-km, which is best done by bus.